One rainy day Riley stares out the window and watches the clouds roll across the sky making all sorts of shapes. Granny says it looks like the city of Sydney but Riley spies a koala among the "gaggle of buildings". Fascinated, he flies off to Sydney in his fabulous red bi-plane to search out the koala. McCartney's imaginative text complements her exceptional black-and-white photography of Sydney at its finest. Riley flies past many iconic Sydney landmarks including the harbour, the beaches, The Rocks, Circular Quay with its ferries, Luna Park, Strand Arcade, Sydney Opera House, Sydney Harbour Bridge as he searches for the elusive koala. Finally he finds the koala sound asleep nestled in a tree at Taronga Zoo. And it is no wonder the koala is exhausted. 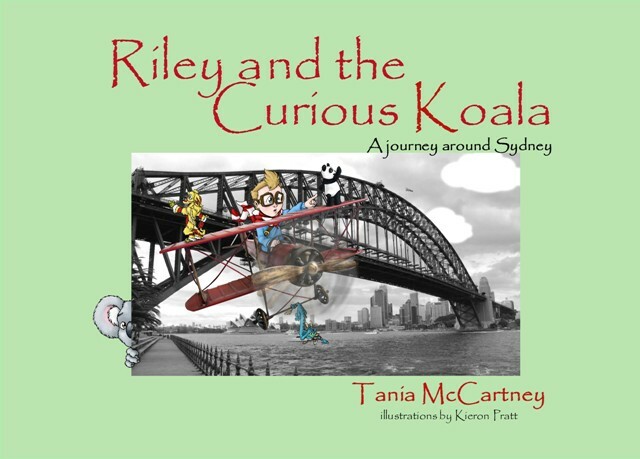 Children will find it hilarious that throughout Riley's journey, the koala is climbing and snorkelling and getting into all kinds of adventures but Riley fails to spot him. Pratt's brightly coloured illustrations inject movement and draw the eye across the page. Panda, Lion and Dragon, Riley's friends from the previous two titles, add humour and that touch of companionship to make Riley's journey a shared journey.